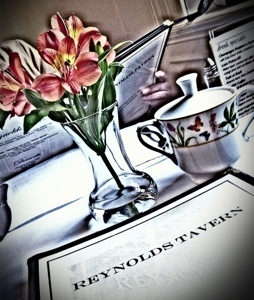 I have to say, the highlight of my gastronomic adventure in Annapolis was my trip to Reynolds Tavern. 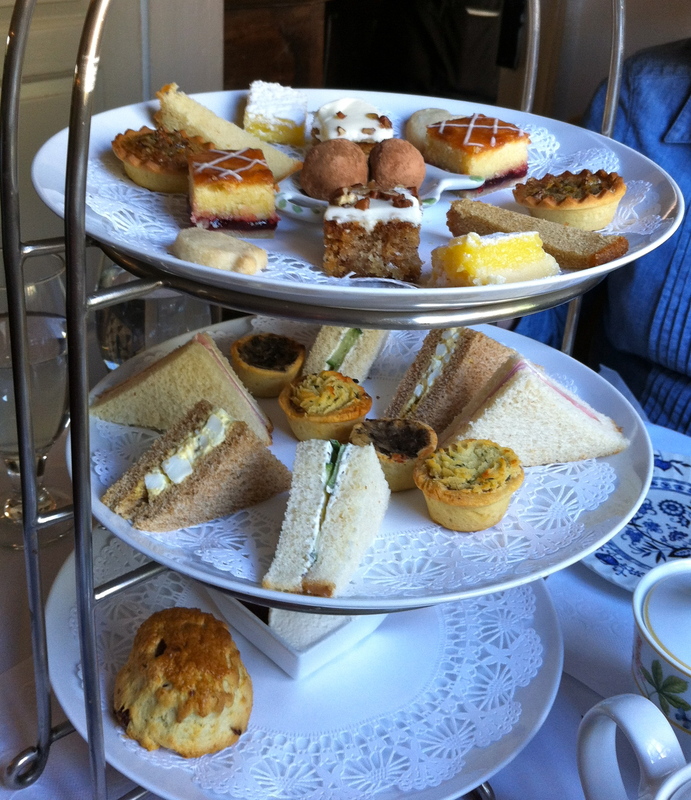 Before I’d even arrived in Annapolis, out of the blue my mom mentions that she has the taste for tea sandwiches. Fast forward a couple of weeks, and as we’re walking down West street we stumble upon Reynolds Tavern. I think it must have been the little yellow tea pots filled with flowers on the table settings outside that tipped us off to their tea service. Regardless, we had found not just tea sandwiches, but a tea experience. 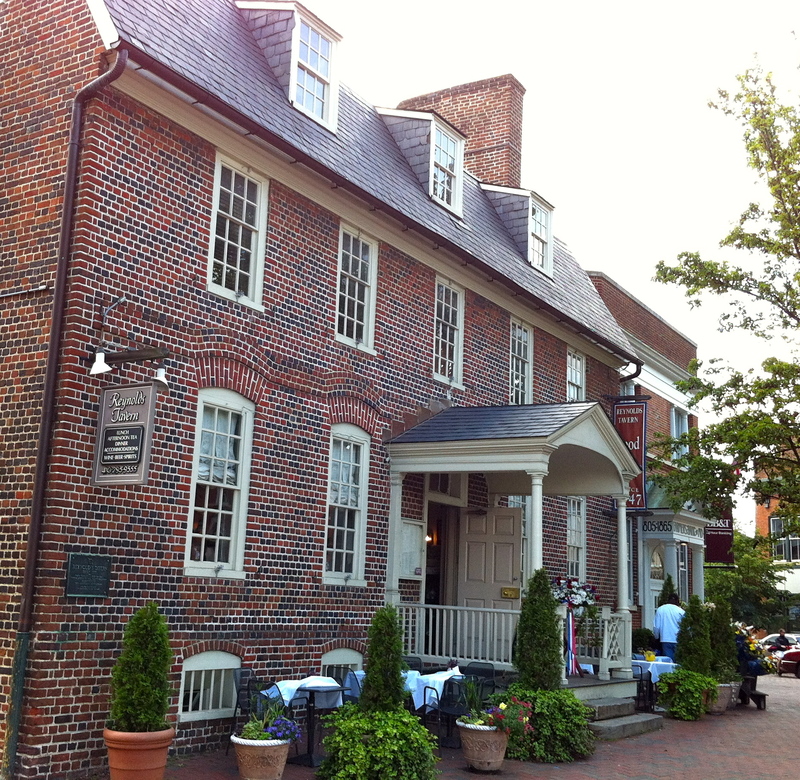 As soon as you step foot into Reynolds Tavern, you are catapulted back in time. The furniture, the candles encased in hurricanes, even the jazz playing in the background, takes you to another era. The atmosphere is definitely fitting for afternoon tea. 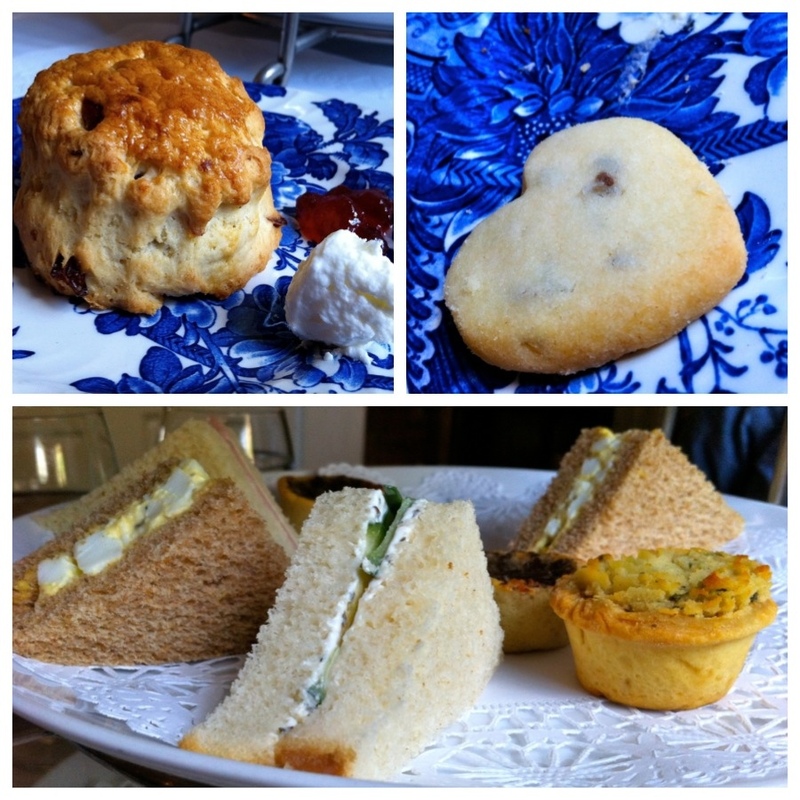 Reynolds Tavern serves afternoon tea a couple of different ways. You can go for the more basic option, like the Cream Tea, a teapot of your choice served with 2 scones, whipped cream and preserves, or try something more elaborate like the Jubilee Tea, with your choice of a first course selection. My Mom and I decided to go the more traditional route, and we both ordered the Colonial High Tea with your choice of “Soup, Salad or Quiche”. 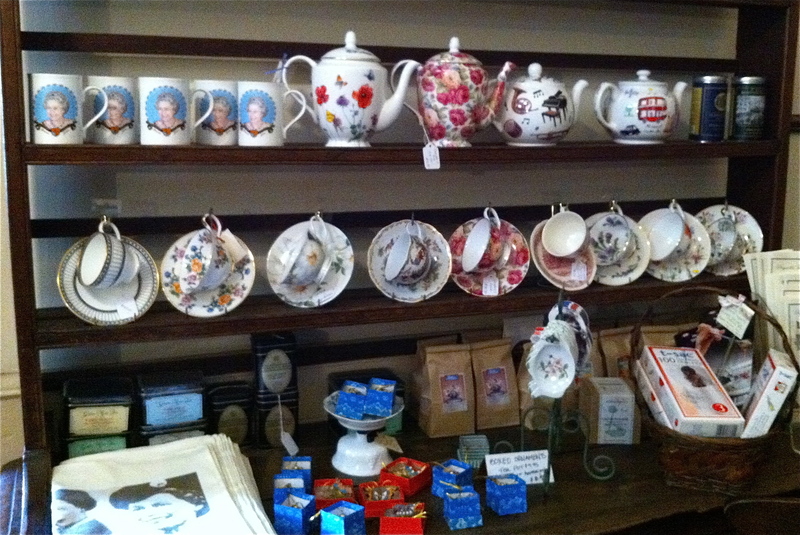 No matter which Afternoon Tea services you order, the real fun comes in selecting your tea. The tea selection at Reynolds Tavern ranges from the basic and more common choices like Camomile and Peppermint, to the more exotic like Yin Zhen Silver Needle or the artful and beautiful Blooming teas. After much deliberation, I decided to go with the Sencha Kyoto Cherry Rose Festival, a green tea. The Secha Kyoto had that sweet nutty flavor, characteristic of green tea, but then it leaves your taste buds with the sweet fruity undertone of cherry. My mom went with the Blueberry Infusion. This tea was a tropical medley of flavors, ranging from hibiscus to blueberries. 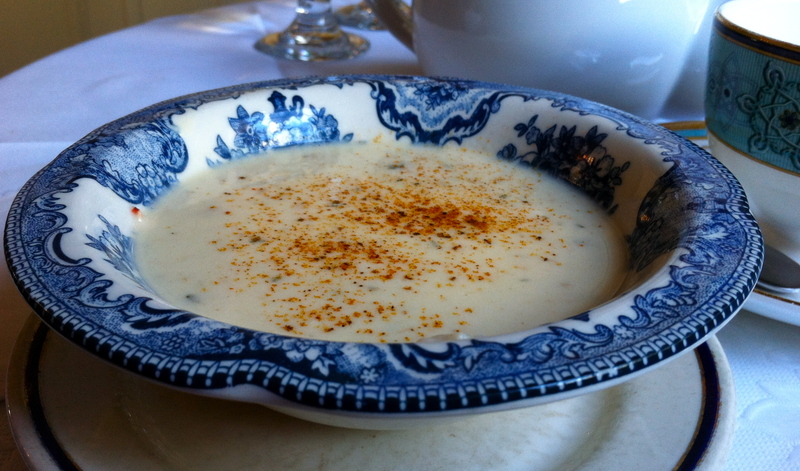 My mom and I both decided on the cream of crab soup for our first course. While our teas were being prepared, we relished our soup. The slivers of crab meat dissolved seamlessly into the cream, and the tarragon gave the soup a nice peppery yet tart flavor. So far, our afternoon tea time was off to a good start. Next, our waiter brought out a three tiered tea tray with an assortment of goodies, all of which are made in house. The bottom tier, had orange and cranberry scones, with a perfect combination of tart and sweet, served with whipped cream and strawberry preserves. The next tier, had tea sandwiches and bite size shepherds pie. The cucumber and egg salad sandwiches were so light and refreshing. Then, the top tier, had a selection of various sweets. The island girl in me enjoyed the banana bread with cream cheese icing. The lavender short bread cookies were also a nice savory addition to the selection of sweets. While I savored every bit of my tea meal, what I enjoyed even more was the experience. A chance to sit back and enjoy the afternoon, to take things slow, to sip on tea and nibble on little sandwiches, to savor the moment and to remember the excitement of being a little girl and having a tea party. I can’t wait to return to Reynolds Tavern. While in Annapolis, my mom and I also enjoyed Lemongrass and Annapolis Ice Cream Company, two other places we visited, on our gastronomic adventure in Annapolis. Click the links to read about our time there. This entry was posted in Out of Town, Restaurants and tagged afternoon tea, Annapolis, DC, dessert, lunch, Maryland, Reynolds Tavern, tea by greedygirlinlv. Bookmark the permalink. Thanks. 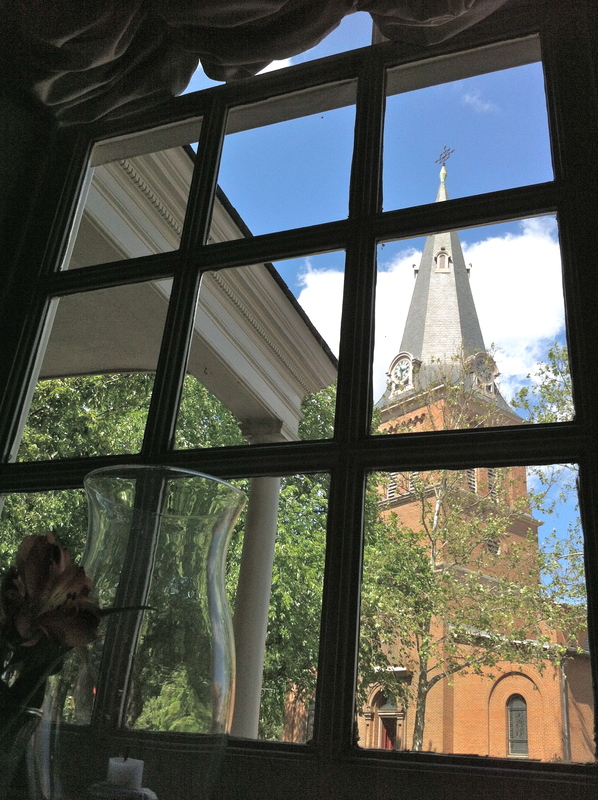 The next time you visit Annapolis you have to go!